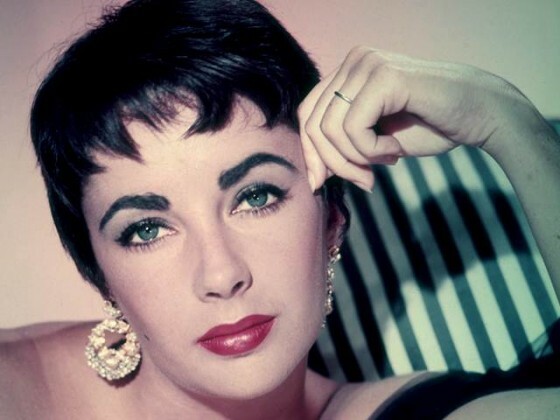 Eyes unique in the world had a big contribution to the success of a great actress who was Liz Taylor. The purple color of her eyes is due to a delicate balance of many factors, genetic and physiological, we will try to shed light on, in the article that follows. Protagonist of this article is the iris, a disc of tissue of approximately 10mm in diameter and a thickness that varies from a tenth of a millimeter from the outside, grows to a maximum of about 6 tenth in the area of ​​the collarette (described in the picture below) and decreases again to about one-tenth in the vicinity of the pupil. The collarette marks the boundary between the inner third and outer two thirds, so it is possible to identify two portions which are named in the iris of the iris or ciliary zone and outer zone of the iris sphincter or courtyard views. As we know, the function of the iris is to measure the amount of light that can enter the eye through the pupil. For this purpose there are two tiny muscles in the iris, the dilator muscles and the iris sphincter muscle . The first has fibers arranged radially so that their contraction causes an enlargement of the pupil. The second is arranged in a ring around the pupil and its contraction determines the narrowing. If you dissect the iris tissue, you discover that it is made up of 5 layers of cells: the front layer, the stroma, the muscle layer, of which we have said, and the posterior pigment epithelium (IPE). Back to the topic of the article, the color of the iris is connected, as one might expect, to the presence of melanin. The name melanin unites different substances, both animal and vegetable, brown or reddish in color as the name suggests deriving from the ancient greek μέλας (melas = black). It has the task of protecting the tissues from the destructive ultraviolet rays that, reaching the organic molecules could break their bonds, creating free radicals and potentially harmful substances. Fortunately melanin is particularly efficient and can to absorb up to the 99% of the UV rays that reach it transforming them into heat. Melanin is produced in cells which are then called melanocytes and is collected inside them in organelles called melanosomes. The layer that we have called the iris pigment epithelium (IPE) is constituted by a double layer of pigmented cells rich in melanin, strictly fused together. It is formed by the differentiation of neuroectodermal and is colored black for virtually all individuals who are not suffering from some form of albinism. 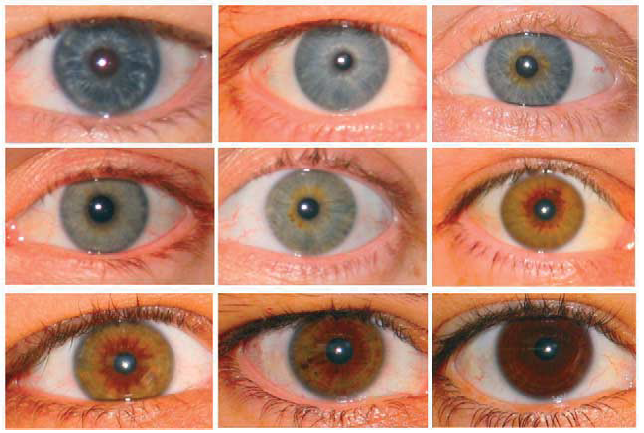 This layer of melanocytes has essentially the task of preventing the light from reaching the lens if not through the pupil and does not contribute to the definition of the color of the iris. The presence of this layer can determine at best the darker shades of gray in those eyes in which the stroma it is especially thin. What actually determines the color of the iris is the interaction with the light of the stroma and the front layer. Even the front layer is rich in melanocytes, but these, in embryonic development, have the same origin of melanocytes in the skin. So also the melanin that they contain will have a variability correlated to that of the skin and, in general, the phototype of the individual. In fact, the melanocytes in the skin can produce two types of melanin, the eumelanin and pheomelanin of which the first has darker shades and the second red or yellow, and this is also reflected on the shades that assumes the iris. If the light that passes through the front layer of the iris finds a large amount of melanin, and this is mainly composed of eumelanin, it will be absorbed, with the result that the iris in question appear brown. If on the contrary the melanocytes produce little melanin, the light will continue his journey and spread in the stroma. The stroma is a tissue rich in collagen fibrils and the light passing through it undergoes a diffusion phenomenon called Willis-Tyndall scattering that is a phenomenon very similar to the Rayleigh Scattering, that is the same that causes the daytime sky to appear blue. The collagen of the stroma, and the atmosphere in the sky, have a similar role, ensuring that of all of the frequencies that make up the white light that passes through them, only those relatively high, i.e. in the area of the blue, are diffused. This causes the blue color which, mingling with the effect of melanin, creates various shades from blue to brown as we can see in the picture below. Finally, to enrich the appearance of the iris, there may be various imperfections in the distribution of collagen fibers and melanocytes, such as to generate an innumerable amount of different patterns. It follows that the iris is a very complex structure, with a degree of complexity that has been estimated to exceed the 240 degrees of freedom. For this reason are being developed security systems and recognition that are based on iris scanning.